After a period of indecision toward her future, singer/songwriter Gin Wigmore is now on the cusp of a promising career. 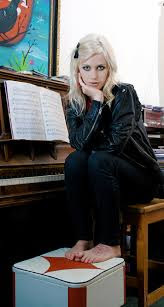 Born in Auckland, New Zealand, she first made a name for herself at 16, winning the grand prize at the prestigious International Songwriting Competition (the youngest person to do so) for “Hallelujah,” which she'd composed in memory of her father. She later included it on Extended Play, a five-song sampler that introduced her as a recording artist, her craftsmanship and soulfully potent voice thrilling critics and listeners alike. With the recent release of her debut LP, Holy Smoke, which she recorded with the Cardinals (known for their work with Ryan Adams), Wigmore’s audience stands to grow exponentially. For more information on Gin Wigmore, including tour dates, please visit the artist's official website and Facebook fan page.